and I shall call him, "Mini-me"
most people make a belt from leather or leatherlike material i think even SDS sell a leather belt ? Thanks I am elated!!! That was the first time I ever wore trooper armor in my life, just this afternoon. Congrats mate! That armor looks tailor made for you! I have a leather belt, but you're right it has to be some kind of canvas. Is that the "Battle Spec" helmet? BTW, your dog is looking at you like you're insane! lol yeah she was kinda freaked out. yep that's the Battle Spec. I like it quite a bit, but it needs some serious work to get it ready for trooping...feels like a plastic fruit bowl balancing on my head. I got most of the things i need to fixer up though...gonna follow this dude's lead I think...see about halfway down this page for what I'm up against. Need to redo the gray frown (they don't come very well-done), add the frown mesh, and add some more/ different padding. biggest thing is to modify the flimsy green film lens material and to add a chin strap. overall, I love the look of the helmet (on me, anyways)--much better proportioned to my build IMHO. yes indeed. another advantage is, it seems to provide a source of ventilation, where glued-in lenses are more air-tight. ah hah, well ive since discovered that welding visors are the ticket. You'll also need to replace your lenses with flat green ones. I got a dark green face shield at RJSafety.com scroll down for"HF4118-DRK - Dark Green Faceshield - $3.65". You can cut it with scissors. Works great for Boba Fett's T-visor too. That's looking like a real sweet looking set of armor. I would suggest installing a hard-hat liner with a chin cup or something for maximum stability and comfortability. Awsome!.....Looks like it fits you perfect. I am very very happy with it!!! Mind if I use one of your suited-up pictures in the Stormtrooper Helmet & Armor list? 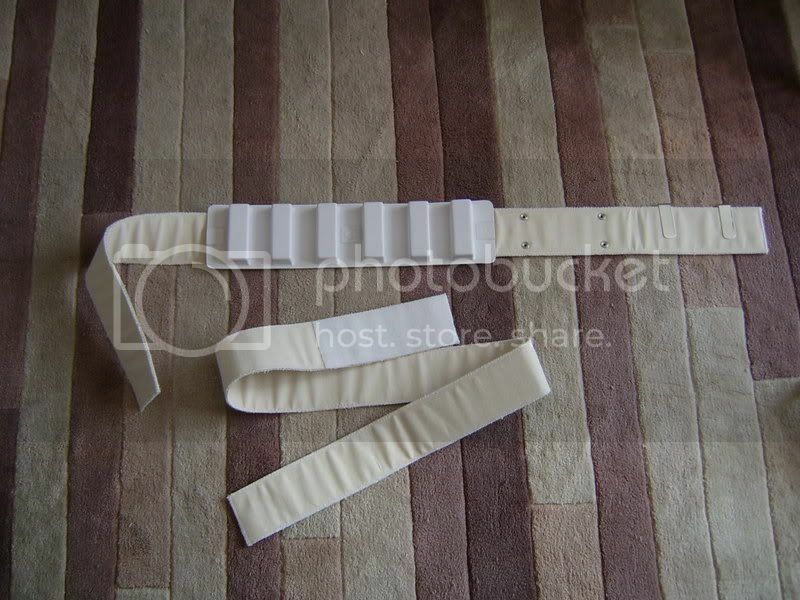 If you looking for movie accurate belts, canvas is the way forward, heres a couple i made for my tk.